Power outages have been reported on Long Island. The Long Island Power Authority said some people may be without electricity for 7 to 10 days. Hurricane Sandy wreaked havoc on parts of the power grid Monday, knocking out power lines across the Northeast and forcing two nuclear power reactors to shut down. Some 6.2 million customers remain without power as of Wednesday morning, according to CNN estimates. In Manhattan, a massive explosion at a ConEdison plant along the East River left a big chuck of the island in the dark. Throughout the region, downed trees and flooding have taken out power lines that serve millions. Utilities say it could take 7 to 10 days to repair the damage, even with extra crews that have been brought in from other parts of the country. A ConEdison spokesman called it "the worst damage in ConEdison history." Much of ConEdison's power equipment is underground, including in subway tunnels. Those tunnels are now flooded, some with water all the way to the ceiling. They are not expected to be drained for several days, New York Mayor Michael Bloomberg said at a press conference Tuesday. On Long Island, nearly a million customers are without power, according to the Long Island Power Authority. New York Gov. Andrew Cuomo, also speaking at a press conference, said that amounts to 90% of the customers on Long Island. Unlike in Manhattan though -- where the underground flooding was unprecedented -- Cuomo said LIPA has had plenty of time and experience to prepare for such an event. In New Jersey, utility PSE&G described '"walls of water" that flooded electric substations in coastal parts of the state. 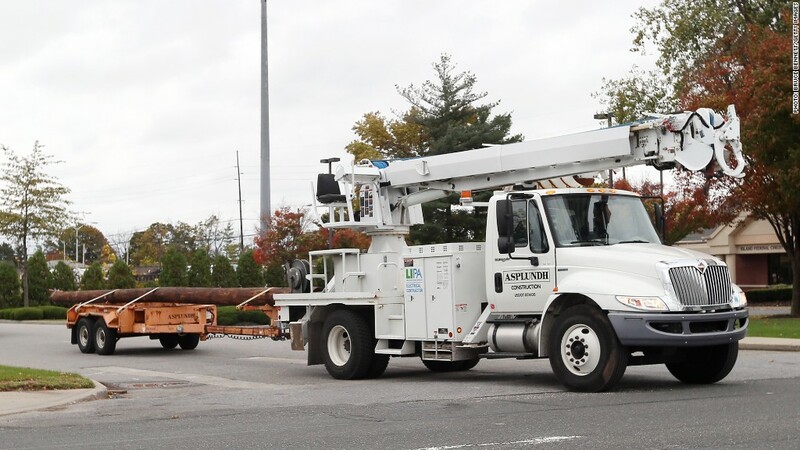 Over a million customers are without power in New Jersey, and the utility said restoration will be "a slow, painstaking process." Complicating restoration efforts is the size of the storm. Utilities have agreements with each other across the country to send spare workers in the event of storm. But with so many states impacted by Sandy, there aren't many spare workers available. Two nuclear reactors in the New York region closed overnight Monday as Hurricane Sandy disrupted operations at the facilities. At the Indian Point power plant, located 34 miles north of Midtown Manhattan, one of two reactors automatically shut down at 10:45 p.m. Monday night after equipment detected a problem with the external power grid, according to plant spokesman James Steets. The reactor was able to obtain power from other outside sources, but shut down as a precaution, said Steets. He said the reactor should be back online within a few days. In New Jersey, a reactor at the Oyster Creek power plant was manually shut down in the early morning hours after pumps that draw water from the Delaware Bay became unavailable because of the storm, according to a statement from the plant's owner, PSEG Nuclear. The shutdown occurred without incident and PSEG said the reactor is "stable." The pumps are used to condense steam on the non-nuclear side of the plant, the statement said. There was no word as to when the reactor may restart. An adjacent reactor at the same plant remains operating at full power, while a third was previously shut for refueling. Related: How close is your home to a nuclear power plant? Nuclear plants use electricity and electric pumps for many purposes, including circulating the water that cools the reactor core and, in some cases, the spent nuclear fuel. It was a power failure in Japan caused by massive flooding that ultimately led to the meltdown at the Fukushima Daiichi nuclear power plant. The Nuclear Regulatory Commission, the federal agency that regulates nuclear safety, sent additional inspectors to nine plants in the storm's path to make sure all safety procedures were followed.